Maybe you’ve heard all the buzz about matcha green tea, but you’ve wondered about all the hype. What exactly are the health benefits? Is it really a good alternative to my coffee or even my green smoothie? In this video I will be explaining the health benefits of a matcha latte and showing you how to make one. A few weeks ago, I did a video on How to do Yoga in the morning in which I suggested making the morning special with a matcha latte. 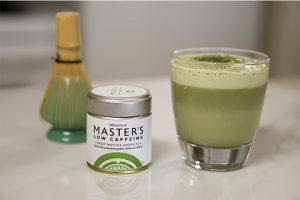 Many of you wanted to know how I made my matcha latte. 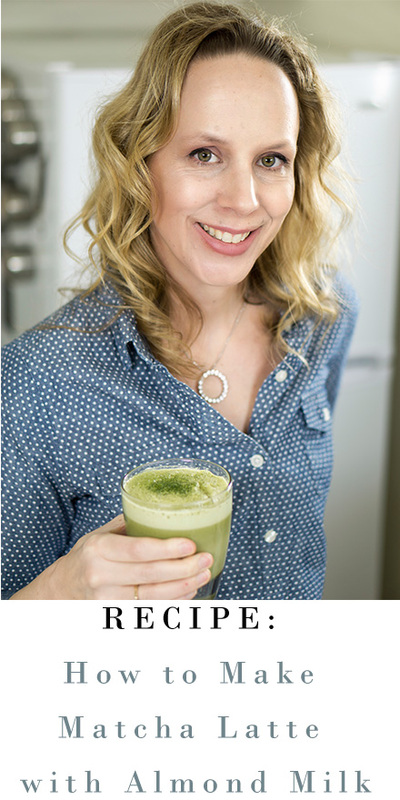 Today I am going to take you through how to make a matcha latte as well as why you would want to do that. Matcha is a clean alternative to coffee that will not give you the coffee caffeine crashes. While coffee contains 80-120 mg of caffeine and is acidifying. Matcha contains only 20-25 mg of caffeine and is alkalizing. Because of the way that the plants for matcha tea are grown and harvested, they have higher levels of L-theanine and chlorophyll in their tea leaves. Matcha only uses the tender tea shoots found at the top of the tea plant. So what is L-theanine? Well, it is an amino acid found in tea leaves. In short L-theanine will give you sustained energy and focus. In more detail, L-theanine contributes to a number of changes in your brain. L-theanine boosts the levels of GABA in your brain GABA is a neurotransmitter which regulates emotions, mood concentration, alertness, energy, cognitive skills, increases calm and relaxation and even helps you sleep. L-theanine brings a feeling of calm by reducing the chemicals in your brain that are linked to stress and anxiety. L-theanine is said to release alpha waves in your brain. This is the brain wave state that is associated with meditation and creativity. The great thing about L-theanine is that it is relaxing without being sedating. Secondly, matcha has antioxidants called catechins, specifically EGCG. Match is said to have up to 137 times more EGCG than all other tea. The antioxidants found in matcha can help to lower your risk of cancer. Research studies have shown that the EGCG in matcha lowers the risk of breast cancer, prostate cancer and colon cancer in humans. Like the L-theanine, the EGCG also has a positive impact on your brain. It reduces fatigue and helps to relax and refresh your brain. Many of you have probably heard that green tea can help you lose weight, well, it is the EGCG that suppresses and enzyme and breaks down norepinephrine. This increases the amount of norepinephrine in your body signally for more fat cells to be broken down and used for energy. The EGCG also improves your insulin sensitivity and lowers blood glucose levels, also reducing your risk for Type II diabetes. Oh, and why would you want to replace your green smoothie with a matcha latte? This is a question that has come up a few times recently, particularly since I mentioned that I no longer make juices and smoothies. Quite simply, green smoothies and juices are cold, damp and full of sugar. They literally destroy our digestive tract and digestive fire. It is much healthier for our digestive system to take in warm, cooked foods according to both ayurvedic and traditional chinese medicine. OK, let’s make our matcha latte. First I will show you how easy it is to make the perfect bowl of traditional matcha at home. 1. Choose your favourite matcha. I will be using the low caffeine DoMatcha which has only 6 mg of caffeine, the same as decaf coffee. It has all the nutritional value with the catechins and L-theanine. 2. You will need a whisk, a bowl and a scoop. 3. Letting your boiling water cool a bit. Boiling water is 100 degrees celcius and you want your matcha water to be 80 C so you don’t bring out the bitterness or kill any of the nutrients. 4. Put 1/2 tsp – 1 tsp of Do Matcha into your bowl. Add 2-3 ounces of pro-boiling water to your Do Matcha Whisk in a W motion until froth forms on the top. Slow down and move the whisk to the surface to remove larger bubbles and make a smooth froth. Move the whisk slowly around the bowl and lift warefully from the center to remove. Add more water or warmed almond milk after whisking. You may also want to make a superfood matcha latte. You can treat this like a warm smoothie and place all your ingredients in the blender. 1. Place 1/2-1 tsp. of DoMatcha in the blender. Add superfoods such as coconut oil, maca, complete 360, collagen etc. You can sweeten with agave or maple syrup and add a touch of vanilla. 2. Blend until a froth forms. If you watched all the way to the end, I love my fabulous finishers.. Let me know by putting “I feel energized and focused” in the comments. Thanks for pressing the like button and I will see you next week for a video on how to sleep better.